This application protocol describes the isolation of highly purified and viable oligodendrocytes from neonatal mouse brain tissue. Brain tissue from mice younger than P8 is dissociated into a single-cell suspension and Anti-O4 MicroBeads are used to isolate oligodendrocytes. The O4 antigen, a sulfatide of the glycosphingolipid class is a marker for oligodendrocytes. During oligodendrocyte development, O4 expression begins on late oligodendrocyte progenitors that are A2B5-positive. While A2B5 expression disappears, O4 continues to be expressed. O4 expression is also found in Schwann cells. The isolation of O4+ cells leads to highest purities if P3–P7 (postnatal day 3–7) rodents are used. Mouse brain tissue derived from P3–P7 CD-1® mice contains approximately 5–10% O4+ cells. Fluorochrome-conjugated Anti-O4 antibodies for flow cytometry analysis, e.g., Anti-O4-PE (# 130-095-887) or Anti-O4-APC (# 130-095-891). Learn more about our antibodies and dyes. PB buﬀer: Prepare a solution containing phosphate-buﬀered saline (PBS), pH 7.2 and 0.5 % bovine serum albumin (BSA) by diluting MACS® BSA Stock Solution (# 130-091-376) 1:20 with PBS. Keep buﬀer cold (2-8 °C). Degas buﬀer before use, as air bubbles could block the column. MACS Columns and MACS Separators: O4+ cells can be enriched using LS or MS Columns. Positive selection can also be performed using the autoMACS® Pro Separator or the MultiMACS™ Cell24 Separator. PB Buffer: Prepare a solution containing phosphate-buffered saline (PBS), pH 7.2, and 0.5 % bovine serum albumin (BSA) by diluting MACS® BSA Stock Solution 1:20 with PBS. Keep buffer cold (2−8 °C). Prepare fresh on the day of use and degas the buffer, as air bubbles could block the column. Coat a 24-well culture dish with 0.01 % Poly-L-lysine overnight at 37 °C. Wash three times with ddH₂O the following day. Prepare the following cell culture medium: MACS Neuro Medium containing 2 % MACS NeuroBrew®-21, 1 % penicillin/streptomycin and 0.5 mM L-glutamine, 10 ng/mL Human PDGF-AA, and 10 ng/mL Human FGF-2. Isolate O4-positive oligodendrocytes using the Anti-O4 MicroBeads, human, mouse, rat. Follow the protocol of the kit data sheet. The recommended antibody dilution for labeling cells is 1:11 for up to 1×10⁷ cells/100 μL of PB buﬀer. Volumes given below are for up to 1×10⁷ nucleated cells. When working with fewer than 1×10⁷ cells, use the same volumes as indicated. When working with higher cell numbers, scale up all reagent volumes and total volumes accordingly (e.g., for 2×10⁷ nucleated cells, use twice the volume of all indicated reagent volumes and total volumes). Analyze 100 µL of the positive and 100 µL of the negative fractions. Optionally, also include 20 µL of the original fraction in the analysis. Resuspend up to 1×10⁷ nucleated cells per 100 μL of PB buﬀer (see "Things to prepare in advance of cell isolation and cell culture"). Add 10 μL of Anti-O4-APC. Mix well and incubate for 10 minutes in the dark in the refrigerator (2–8 °C). Wash cells by adding 1 mL of PB buﬀer and centrifuge at 300×g for 10 minutes. Aspirate supernatant completely. Resuspend cell pellet in a suitable amount of PB buﬀer for analysis by ﬂow cytometry, e.g., using the MACSQuant® Analyzer 10. Plate 5×104 cells in 50 µL of prepared medium as a drop in the middle of each well of a coated 24-well plate (see "Things to prepare in advance for cell isolation and cell culture”). Let cells settle for 30 minutes at 37 °C in the incubator. Cultured oligodendrocytes from neonatal mouse brain tissue. Neonatal whole mouse brains were dissociated using a Neural Tissue Dissociation Kit. Subsequently, oligodendrocytes were isolated using the Anti-O4 MicroBeads and O4-positive oligodendrocytes were cultured in MACS® Neuro Medium, MACS NeuroBrew®-21, 1% P/S, and 0.5 mM L-glutamine (+ PDGF-AA and FGF-2) on PLL-coated glass coverslips (5×104 cells per well of a 24-well plate). After 5 days, in vitro cells were fixed and stained with the oligodendrocyte-specific antibody Anti-MBP (green). Neonatal whole mouse brains were dissociated using a Neural Tissue Dissociation Kit. Subsequently, oligodendrocytes were isolated using the Anti-O4 MicroBeads. O4-positive oligodendrocytes were cultured in MACS Neuro Medium, MACS NeuroBrew-21, 1 % P/S, and 0.5 mM L-glutamine (+ PDGF-AA and FGF-2) on PLL-coated glass coverslips. 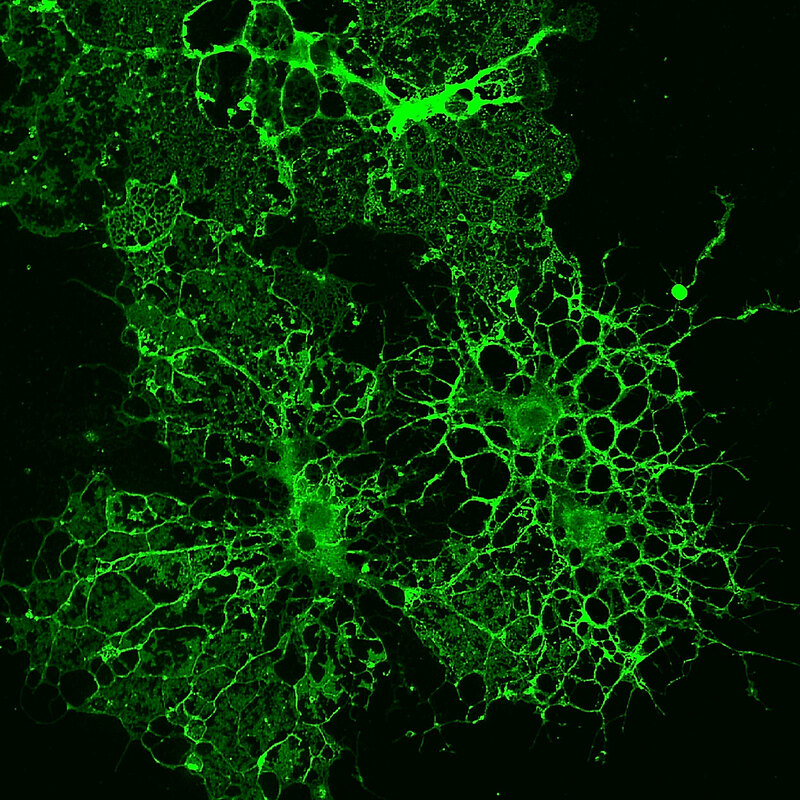 After 5 days, in vitro cells were fixed and stained with the oligodendrocyte-specific antibody Anti-MBP (green).